The taco is a staple of Mexican cuisine, so it might be surprising to learn that tacos don’t have a very long history. There is no exact history of where and when they came about. However, historian, Jeffrey M. Pilcher, professor of history at the University of Minnesota, has traveled around the world researching Mexican food. He has a few ideas about the history of tacos, and you may be surprised to read his conclusions. It is believed that the origin of the taco started in Mexican silver mines. Mr. Pilcher believes that they came about some time in the 19th century. This hypothesis about the taco comes from the fact that the first type of taco was “taco de minero,” which translates to mean miner’s tacos. Also, have you ever realized that taquitos look similar to a stick of dynamite? Taquito is a Spanish word that translates to small taco. 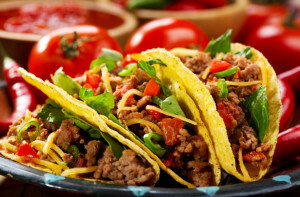 It is believed that the word taco originally referred to pieces of paper that miners would wrap around gunpowder and use in holes that were carved into the face of the rock. So as you can see, the taco isn’t an age-old cultural food, it is fairly new, compared to some of the other Mexican foods dating back to Aztec times. The role of the “taquería” (taco shop) is also an important element in the history of the taco. For many years, taquerías were mostly for working class Mexicans. Many women migrants brought tacos to Mexico City to sell for income. These women eventually made Mexico City into a taco hub, with many different styles and kinds of tacos that people could sample. It probably isn’t surprising that the real popularity for the taco came from the popular fast food chain, Taco Bell. The founder of Taco Bell, Glen Bell, created a franchise for people that wanted to experience the taco, but didn’t want to travel all the way to Mexico to taste one. The taco originally came to the U.S. through migrants that traveled to the Los Angeles area in the early 1900s. It was originally seen as a low-class street food. The tacos that were sold as street food in the U.S. were not traditional tacos that you would find in Mexico. This is due to the fact that the ingredients that are available in the United States are not the same as the ingredients that are available in Mexico. The hard taco is not a traditional Mexican staple. This is not to say that Glen Bell founded the hard taco. There is evidence that the hard taco shell existed in U.S. Mexican restaurants nearly a decade before they were used in Taco Bell. In fact, it is rumored that hard tacos are so popular because they stay fresh for much longer when compared to soft tortillas.